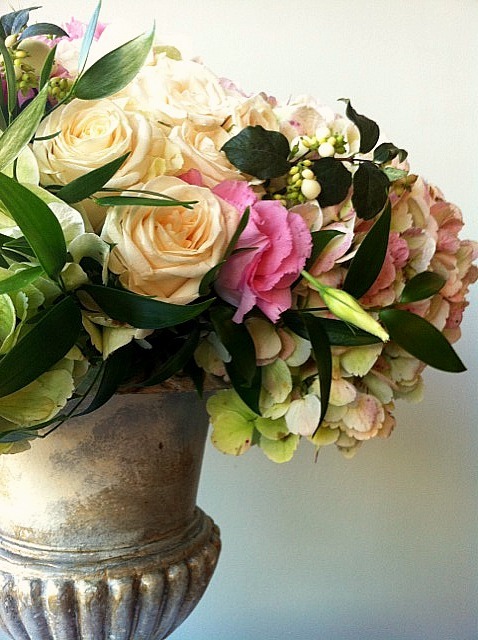 It’s hard to say which we love more – a beautiful collection of flowers, or a big urn to put them in! It’s a good thing they get along together so wonderfully, because we would hate to choose a favorite. So we made a flower arrangement that could sit alone on a table or sit in a big urn. This arrangement is remarkably versatile. Only three types of flowers, but what wow factor! Hydrangeas, white roses, pink Lisianthus, Italian ruscus and snowberries come together beautifully. The arrangement is anchored by oasis in a small plastic bowl… so we actually put it together on a flat table… not in the urn itself. So then you can leave it on a flat tabletop, allowing for easy conversation during dinner, or put the small bowl in an urn, and get instant drama. Looks nice enough, right? … you might see it at a wedding reception or banquet table. But look at it when it goes into a big urn, allowing the hydrangeas and greens to cascade over the edge! Then we added some greens that poke out a little higher than the flowers, giving it a wilder, more garden-like feel. And we have a winner!